I have never been particularly enamored with The Two Doctors. While it was nice to get the relief of Patrick Troughton and Frazer Hines back into the show during a season that was lead by the bickering characterizations of Colin Baker and Nicola Bryant (neither of whom I consider to blame for that nonsense), the story itself was still poorly written, somewhat scattershot, and a bit muddled. I can ignore strange contiuity issues for the Second Doctor and Jamie, because the show's contiuity is the biggest mess in all of franchise contiuities...but I just didn't find the story engaging at all. 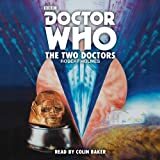 So we come to Robert Holmes novelization of his episode, now brought to life in audiobook form by the Sixth Doctor himself - Colin Baker. In general, I think this version is better. I attempted to rewatch the TV version, but the tone kind of turned me off. But the book has better characteriations, more gruesome death scenes for characters, and flows a lot better. For instance you spend a lot of time with the Second Doctor and Jamie before cutting to the Sixth Doctor and Peri. In the show, they cut back and forth early on, and it is more muddled and doesn't flow as well. I think one of the weirdest things about it is that it is a multi-Doctor story for no real reason. The book fixes some of those story flow issues. That isn't to say that the story is suddenly really interesting, because it is still mediocre. The villain's evil plot is too vague, the Sontarans don't really do much, and the threat to the Doctor seems minimal. Having the Second Doctor's life in danger might actually be interesting if it seemed as if the Sixth Doctor could be wiped from existance, but they never really go for it. I never feel like the threat is real. I think multi-Doctor tales need to be saved up for special occasions. Anniversary's are worth it. Or in the case of Time Crash, as a comedy sketch for charity. But this episode did it just for fun, and since the story has no real need for Patrick Troughton or the Second Doctor to return, it just seems like a lame reason to bring him back. It diminishes the excitement of having two Doctors together when it isn't for a big occasion and is just in the middle of a season. As for the audiobook itself, Colin Baker does a great job reading it. That should come as no surprise to anyone that has heard his excellent work for Big Finish. He makes the story seem far more interesting than it actually is, and reads with gusto. It will alwys be a bit of a bummer that this charismatic guy got such a short straw on TV. Just two seasons worth of pretty horrible stories in an obnoxious costume. When a mediocre story like this is on the better end of his television output, that really is a shame. I don't think this audiobook is particularly worth it. Baker's narration is top notch, but it is all in service of a lame story.